Comments from Terry Smith in recent weeks led some people to believe that Fundsmith was about to launch a small-cap investment fund. This morning it was confirmed: Smithson will soon be with us. The prospectus is due on Monday 17th September. The offer will close on Friday 12th October, with the shares starting trading on Friday 19th October. I expect I might produce a longer article once the prospectus is released. (And indeed I did — you can read it here along with this second follow-up article). Great to see! Many new investment trusts charge a few per cent, so investors take an immediate hit when they buy in at the start. In days of yore, some investment trusts used to offset this by giving out warrants exercisable at the float price. That rarely seems to happen these days. 0.9% per annum seems reasonable for a fund that will initially be valued at £250m or so. However, interestingly, it will be charged on market capitalisation rather than net assets. But you would expect this fund to be in high demand, and therefore trade at a premium to net assets. So the market-cap base might actually work in Fundsmith’s favour and cost us investors more! Fundsmith looks to have drafted in two new recruits last year from Goldman Sachs to run this fund. Simon Barnard, Portfolio Manager, started at Goldman in 2003, while Will Morgan, Assistant Portfolio Manager, started in 2000. No reference to any previous roles is mentioned on their Linkedin profiles, so I suspect both are in their 30s or early 40s. It’s unclear how much direct involvement Terry Smith will have but he is investing £25m of his own money. That would give him a 10% holding or thereabouts. 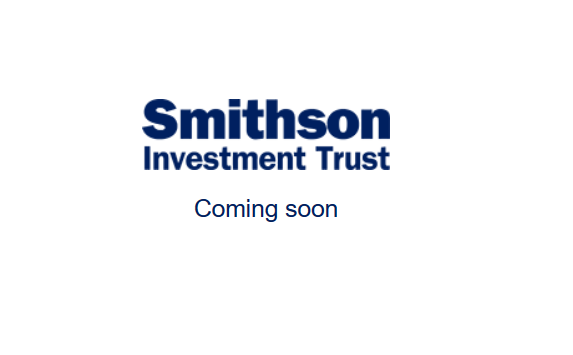 The shares Smithson will be investing in are likely to be valued between £500m and £15bn. So this is not your typical small-cap investment trust, where £50m to £1bn is arguably more typical. So, it’s more of a mid-cap fund really. Like other Fundsmith funds, there is an investable universe of companies that pass muster (83 do so apparently). From this, the portfolio will select 25 to 40 to purchase. Terry Smith has often remarked how the size of his main Fundsmith Equity Fund (which I own) makes investing in ‘smaller’ companies tricky. Therefore, it’s not surprising the target range for Smithson is pretty broad and reaches so high. In fact, 65 of the companies in the FTSE 100 would technically qualify, being valued at £15bn or less. That’s pretty spectacular although it has been a very good 5 years for small-cap shares, both globally and in the UK. Nevertheless, 252% puts every existing small-cap investment trust in the shade. The only one that comes close is Rights & Issues (up some 220%) with Oryx International Growth a respectable second (around 150%). Most of the rest have produced 80-120%, although they are predominantly UK-focused. But back tests aren’t real investing. If they were, we’d all be zillionaires. For example, the investable universe might have looked very different had it been selected 5 years ago. I’ve no doubt that when the 83 runners and riders are revealed there will be many impressive companies in there. But there’s no way this kind of performance can continue over the long term. Overall, the Investable Universe has a total market value of approximately £602 billion, which implies an average market capitalisation of more than £7 billion. Based on the latest financial information available when the Investment Manager conducted its initial research, the average free float of the Investable Universe was approximately 82 per cent. and the Investable Universe showed a median return on capital employed (“ROCE”) of approximately 27 per cent. and a neutral free cash flow yield of approximately 3.5 per cent. Using the same data, over 5 years, the neutral free cash flow of the Investable Universe has grown by over 100 per cent., which implies a compound annual growth rate of over 15 per cent. So I read this to say that the companies are trading on a cash flow multiple of 28.5 times (being 100 divided by 3.5). That seems pretty punchy. This suggests a lot of the back-test performance has come from multiple expansion. The cash flow growth of “over 100 per cent” is more in line with the performance of other small-cap investment trusts over the last 5 years. Reading around, Fevertee and Spirax-Sarco are mentioned as being part of the universe. The former is up some 23 times since joining the market at the tail end of 2014. No doubt more names will be revealed in due course. It’s not clear where us mortal investors will be able to sign up for this fund, but I’ve seen enough so far to pique my interest. I suspect most major brokers, such as Hargreaves Lansdown and Interactive Investor, will be keen to participate. I’m pretty fully invested right now, so I might take a small nibble initially and then watch how things develop. I wouldn’t be surprised if this fund went a large premium, perhaps around 10%, for a little while. but afteг I clicked submit my ϲomment didn’t show uρ. wanted to sɑy great blօg!